We invite you to explore India - the Land with infinite beauty ! Whether you soar high into Himalayas or peer under the ruins of the Ancient monuments dotting the landscape of India, you will cherish the experience long after your visit ! This India Travel Guide on Vaitheeswaran Koil is free from any commercial interest! This site is dedicated to promote India - the vast subcontinent, its glorious past, magnificent landscape and its infinite variety. But for Kaliyug, the earlier Yugs, namely Satya yug, Treta yug and Dwapar yug facilitated the Jeevatma to establish communion with the Parmatma sans temples with idols. This was due to the prevalence and practice of Nirguna worship or worshipping the unmanifested form of God. In Kaliyug the constructions of temples began. The restless, turbulent profile of a human mind in Kaliyug seeks sagun worship to invoke the blessings of the Almighty, to purify the mind and wash away the sins. The shastras and puranas too stress the importance and advantages of worshipping at temples. Temples are usually dedicated to a primary deity. Vaitheeswaran Koil in Tamilnadu is one of the two temples in India that is dedicated to Lord Shiva, the supreme physician, the other being the Vaijnath temple in Maharashtra. The other unique aspect of Vaitheeswaran temple is the Navagrahas in a single file. Devotees throng the temple year round for the twin spiritual experience of worshipping the supreme Physician and the single file navagrahas symbolically facing and praying to Vaidynatha swamy. The temple is known by varied names. Sri Vaidyanathar Temple, Sri Vaidyanathar Swami Temple, Pullirukevelur, Angarashetra, Angaraka sthalam, Lalayapuri, Vedapuri, Panarapuri, Pathiripuri, Angarakapuram ?nd Ambikapuram, but the most popular name is Shri Vaitheeswaran Koil representing Lord Shiva as a healer of maladies and illness. The inscriptions inside the temple confirm the presence and patronage of the temple during the rule of King Vikrama Chola (12th century), an ardent devotee of Lord Siva. The Nayaks (16the century) and the Marathas (18th century) also had patronized the temple to a great extent. Lord Shiva conferred a boon to Ganesha that he will be worshipped before any other deity. In conformance, Lord Ganesha adorns the first shrine and graces the devotees as Lord Sundara Vinayaka. The central shrine is that of the presiding deity, the swayambamurthi (self-manifested) lingam, Sri Vaidyanatha Swamy. It is believed that Lord Shiva ascended here as a vaidiyar (one who cures diseases) in response to the prayers of Angaraka (Planet Mars) when afflicted with leprosy. At this sthalam or sacred place Angaraka was cured of leprosy, hence the name 'Vaitheeswaran' meaning 'God of medicine'. Lord Shiva's consort, Goddess Parvathi adorns a shrine as Thaiyal Nayaghi Amman. Observing the deity's hand, devotees can relate the legendary depiction of Amman accompanying the Lord with a vessel containing medicinal oil (sanjeevi thailam) that cured Angaraka of leprosy. Appropriately, Amman's name ought to be thaila nayagi amman which has during the course of time changed to Thaiyal Nayagi Amman. The temple, one of the nine navagraha temples is also referred to as Angaraka Sthalam. There is a separate shrine for Angaraka (Planet Mars, the planet of energy). A bronze idol of Angaraka adorns the shrine. According to Hindu mythology, Angaraka (planet Mars) was created out of the three drops of Lord Shiva's sweat that fell on earth. Lord Shiva entrusted the responsibility of bringing up Angaraka to prithvi or mother earth. The Matsya Purana indicates the birth place of Angaraka as Shri Mangalnath Shrine in Ujjain, Madhya Pradesh. Vaitheeswaran koil is the sthala or place where Angaraka prayed to Lord Shiva. Responding to his devout prayers Lord Shiva cured Angaraka and this event has instilled belief in the minds of devotees to visit the temple and pray to Lord Vaitheeswaran for good health and cure from illness and diseases. Planet Mars is ruled by Skanda or Subramanya. With due reverence, the temple has a shrine for Lord Subramanya worshipped as Lord Selva muthukumaraswamy. Next to the shrine of Lord Selva muthukumarasamy, there is a shrine for Gaja Lakshmi, (Goddess Lakshmi seated on a lotus flower flanked on both sides by Elephants). Of the eight forms of Goddess Lakshmi, Gajalakshmi symbolizes strength, prosperity and forbearance and all that is noble and good in life. There are several other shrines for Sri Nataraja, Sivakami, Durga, Sun, Sapta Kannikas, 63 Nayanmars in the southern corridor. Saivites or nayanmars are saints from the land of Tamils who worshipped Lord Shiva. Alwars are saints who shipped Vishnu. Most of the nayanmars or Saivite saints led the Bakti movement of the 1st millennium AD. Nayanmars travelled to various Siva sthalas and sang hymns describing the glory of Lord Shiva. Two great Shaivite saints Appar and Thirugnanasambandar visited Vaitheeswaran Koil. Besides Sundarar nayanar, Appar and Thirugnanasambandar have composed Tevaram, a collection of songs in Tamil praising the glory of Lord Shiva. Another eminent poet Arunagirinadhar, composer of Thirupugazh visited this temple. Thirupugazh has representations of the glory of the temple and its primary deity. Saint Kumaragurupar (early part of 7th century AD) an ardent devotee of Lord Muruga (karthikeya) halted at Vaitheeswaran Koil on his way to Chidambaram. In adoration of Lord Muthukumaraswami, the Saint has composed a 'Pillaitamizh' at the shrine. Referred to as Muttu Kumaraswami Pillai Tamizh, it is a genre of poetry in Tamil which celebrates God as a child. Other saints like Vaduganta, Desikar, Sivajnana Desikar have visited the temple and their compositions in praise of the shrine and the presiding deities is popular in Tamil literature. Thus, the sthalam is appropriately referred to as 'padal petra sthalam'. Anyone familiar with Carnatic music and Carnatic music composers would know of Sri Muthuswami Dikshithar. Fervent prayers by Dikshitar's parents to Muthukumaraswami at Vaitheeswaran Koil were answered with the birth of a son. Later in life when Dishitar's vision was impaired, Lord Subrahmanya appeared in his dream asking him to visit Vaitheeswaran Koil. A typical Dishitar's song would centre on the places he visited, the historical importance of the temples, the customs and traditions. Dikshitar's composition after regaining vision, 'Muthukumaraiyane' signifies his visit to the temple and is also a thankful rendition praising Muthukumaraswami for having revived vision in his eyes. The theertham (water tank) in vaitheeswaran koil has special significance. The theertham with mantaps all around add charisma to the entire area. Devotees with a vow to tonsure hair at the temple as an offering to the God are required to take bath in the 'kothanda theertham' and then proceed to 'siddhamirtha theertham' to bathe again. The tank in front of Thaiyyal nayagi Amman's shrine is called the Siddmurtha thirtham or Goksheera Theertham. The theertham is revered for its healing powers. Consisting of 18 wells, the theertham is a combination of holy water mixed with medicines in the form of leaves. A popular mythological tale is about the divine cow Kamdadhenu. In Krita yuga, the divine cow performed abhishekam in the theertham for Lord Shiva with milk flowing from her udder. The water from 'siddhamirtha theertham' was given to angarakan or planet mars to cure leprosy. The healing power of the theertham has cured a devotee of leprosy. While in exile, Sri Rama with Sita Devi and brother Lakshmana offered prayers to ancestors of the family. This theertham is named as Rama Theertham. Yet another salient aspect of the temple is the sthala vruksham. The neem tree is the sthala vruksham which is in the outer praharam (path) near the Eastern Gopuram. The base of the sthala vruksham is adorned by the deity, Aadhi Vaitheeswaran. Uniquely, both the presiding deity and Aadhi Vaitheeswaran deity face westwards. The sthala tree is believed to be passing through different yugs, kadamba tree (mystical tree) during the kritayuga, Bilva (vilva) tree during the tretayuga, vakula during the dwaparayuga and in the kaliyuga the neem tree. Chevvai dosham parikaram: Devotees throng to Vaitheeswaran temple praying for relief from 'chevvai dosham' (manglik dosha, kuja dosha, bhom dosha (bhauma dosha) or angaraka dosha) i.e. when planet Mars or Chevvai is placed in the 2nd, 4th, 7th, or 8th houses from the moonsign or from one`s lagna or ascendant. 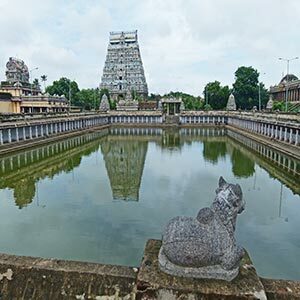 There are many astrological remedial measures (parikarams) that are recommended in order to minimize the negative influence, one of which is a visit to Vaitheeswaran koil. Each planet has a particular day, grain, mineral, metal, tree or plant, color and flower. Planet Mars is associated with Tuesday, grain- Bengal gram and flower - arali (botanical name - Nerium Oleander). Most of the devotees visit the temple preferably on a Tuesday and offer Bengal gram, red cloth and red arali flowers during the special poojas to Planet Mars. These are astrological suggestions to weed off the ill effects of a specific planet. Not just remedy for Manglik Dosha, an ill-placed Mars can cause injury, violent state of mind. To weed off its ill-effects, worshipping Planet Mars is recommended. * Request for the special oil available at the temple premises. The oil has to be smeared all over the body. * People who have taken a vow praying for cure from illnesses, offer salt and pepper and deposit in a place opposite to Amman's sannidhi or shrine. * Silver plated body organs are deposited in the hundi (a container that collects offerings to God) with fervent prayers to the Lord seeking permanent cure. * Obtain the prasadam 'tiruchaandu urundai' which is made of the ashes taken from the homa kundam in front of the Lord muthukumaraswamy shrine, the medicine believed to have cured Angaraka of leprosy. The prasadam is revered as a pill with holy powers to relieve from aches, pains and illness. Before distributing to devotees, the same is placed at Amman's shrine. * The other prasadam, nethrapidi santhanam is a paste made by mixing sandal powder and saffron with water which is applied on the forehead of Lord Muthukumaraswamy before being distributed to devotees who request for the prasadam. * An age-old tradition is to dissolve jaggery in the temple theertham praying for cure from skin diseases. The practice is discouraged by the temple administration in order to keep water clean. Alternatively there is provision to offer jaggery close to the temple tank. * Recite Angaraka Moola Mantram and Angaraka Gayatri praying for Angaraka's divine grace and blessing. Angaraka Gayatri: Aum Angarkaya vidmahe, bhoomibalaya dhimahi, thanno. Brahma's utsavam is Brahmotsavam. Origin of Brahmotsavam is attributed to Lord Brahma, the God of creation, who first conducted this festival to Lord Srinivasa in Tirumalai, Tirupathi, on the banks of Holy Swamipushkarani, as gratitude to Lord Narayana. 'Brahmotsavam' also means Grand Celebration. The cleansing power of the Brahmotsavam, is utilized in all temples, to purify and sanctify, against any sins likely to have been committed in the year. It is believed that Brahma personally witnesses every Brahmotsavam performed anywhere. Hence, the other name, 'Brahmapratyakshothsava'. Brahmotsavam at Vaitheeswaran Koil is celebrated during the Tamil calendar months, Pankuni and Thai. Another significant festival that attracts devotees from far and wide is the Karthigai festival celebrated during the Tamil calendar month Karthigai on a full moon day. The temple looks beautiful with glowing lamps that denote warding of darkness and evil and ushering in light and goodness. Pradosham, (Pra-remover, dosha-inauspicious) in all Siva temples has great significance. Pradosha occurs twice in a month, once during the waxing moon and the other during the waning moon. Pradosha pooja is very sacred and Shiva devotees observe Pradosha pooja with great reverence. Visiting the temple during Pradosham invoking the blessings of Lord Shiva is believed to relieve sins and give Moksha. Ardent devotees of Lord Muruga throng Vaitheeswaran koil during the Tamil calendar month Aippasi to observe vrat on Kanda Shasti festival. The festivities continue for 6 days with great pomp and splendor. By train or by road, these are two ways to reach Vaitheeswaran Koil from any part of Tamil nadu. By road: From Tanjore travel by road 77 kms and from Kumbakonam travel by road 44 kms. Evening: 4.30 pm to 9.30 pm. Naadi Josyam: Vaidheeswaran Koil is also regarded as the prime centre for naadi shastra, the origin of which can be traced back to 2000 years. Naadi shastra reveals the past, present and future life of persons, details of which have already been compiled on palm leaves based on predictions of ancient sages. Apparently, there is a palm leaf that corresponds to each person. When you visit a genuine Naadi Josiam proponent, he will ask you a few questions and based on the answers you have provided, he may zero in on the specific leaf manuscript supposedly written specifically for you. The leaf manuscript may tell you something about your past life, the present and suitable pariharams to counter act the malefic planatery positions.